For the first time ever, you can make decisions armed with definitive and objective evidence, coupled with an eye-opening understanding of how your home or building works. Air sealing is a service designed to tighten your home’s border between the conditioned (that is, heated and cooled) and unconditioned outdoor air. By strengthening this boundary (which is commonly referred to as the “building envelope”), the heated and cooled air in your home is less likely to escape. Your heating and cooling systems don’t have to work as hard to get your home to a desired temperature, meaning they can operate more efficiently. Our team will also conduct a health and safety inspection of gas leaks and combustion appliances, as well as an in-depth interview with you to discuss comfort issues and any specific concerns you have. Our more in-depth energy assessment options use state-of-the-art diagnostic tools to pinpoint areas in your home that need efficiency upgrades. The tools we use include a blower door and duct blaster help us determine the specific needs of your building. Typical energy efficiency upgrades we suggest include air sealing, duct sealing, and insulation. If needed, we can use an infrared camera, and/or perform an indoor air quality evaluation that tests for mold and air with high VOC (volatile organic content) levels. Once your energy assessment is complete, we’ll present a detailed report to you that outlines the areas in need of improvement, the upgrades we suggest, and the predicted outcomes of the upgrades. Our team also uses energy modeling software that calculates applicable utility incentives, net cost of the upgrades, and predicted return on your investment. 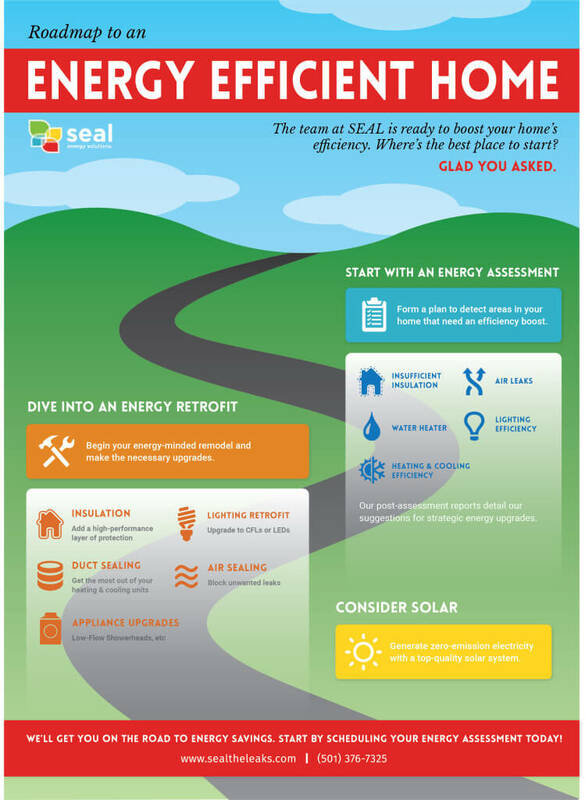 Utility programs will pay up to $100 for a professional energy assessment (which for most clients means a completely free assessment) completed by an approved provider (like SEAL). The program has two types of assessments: Tier One and Tier Two. In a Tier One Survey, we’ll complete a walk-through assessment of your home. Our team will help identify areas of inefficiency in your home. A Tier Two Assessment is more in-depth, and once completed, the utility program will provide incentive coupons for strategic energy upgrades. Whiles energy assessment rebates do not cover 100% of the cost of the improvements, the incentives cover a percentage. How much the rebates cover depends on the results of the energy assessment and how much improvement your home requires. The SEAL team will always go over the ROI so that you will know the return on your investment BEFORE you move forward with the work. Increase efficiency in your space. Contact us today to schedule your energy assessment! Recently work with SEAL? Let some of your friends know about our services!